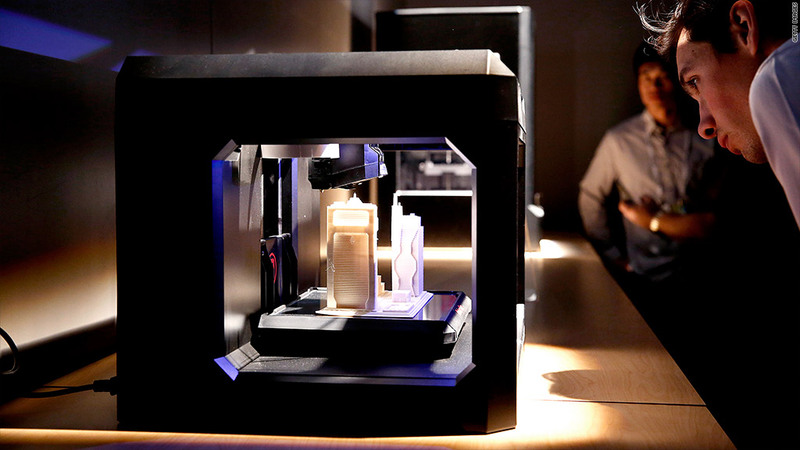 A new mutual fund is investing in stocks tied to the 3D printing industry. The first mutual fund devoted entirely to investing in 3D printing opened for business this week. But it may be way too risky for most investors. The 3D Printing and Technology Fund owns roughly 40 companies, according to Alan Meckler, the fund's portfolio manager. Among them are the pure play 3D printer companies such as Stratasys (SSYS), 3D Systems (DDD), and voxeljet (VJET). But the fund also owns General Electric (GE), which uses 3D printing technology for its jet engines, Meckler said. Still, Meckler has never run a mutual fund before, so there's no track record to study. He does have significant experience running technology companies and taking them public -- but that's not the same thing as being able to pick stocks. Meckler is currently the CEO of Mediabistro (MBIS), a company well-known among journalists for its job listings sites. But the company has increasingly moved into other businesses, including putting on tech industry trade shows. And Mediabistro does have a unit that hosts conferences catering to the 3D printing sector. While running trade shows for companies that Meckler may also own in his mutual fund may smell like a conflict of interest, Meckler says the fund and Mediabistro trade show business will be run separately. And although he admits it's a unique situation, Meckler thinks the trade shows give him an added advantage of being able to study the business closely so that he can make wise investments. "I'm immersed in the 3D printer industry," he said. So why create a mutual fund? Meckler claims investors want exposure to the industry, but they don't know which stocks to pick. Still, there are only a handful of publicly traded 3D printer companies in the U.S right now. It's not as if there are that many choices. And while 3D printing has been around since the late 1980's, the stocks in the sector have soared recently as investors hope to see the technology go mainstream. That's raised concerns about the high valuations for many of the companies. As a result, several of last year's hot 3D stocks have fallen so far this year. Shares of Stratasys are down 9% after surging 65% in 2013. The company bought MakerBot, one of the first firms to sell desktop 3D printers, in August. And 3D Systems is down 15% in 2014 after a huge run last year. 3D Systems already has a presence in the consumer 3D printer market. It's Cube printers are available at Staples and other retailers. But some think 3D printers will never be an everyday household appliance. Terry Wohlers of Wohlers Associates, a consulting firm that specializes in 3D printing, says that smaller 3D printers for consumers are getting a lot of media attention. But they are just a small fraction of the overall market. Rather, Wohlers believes the real money is in industrial manufacturing, which will allow companies to design and produce products more efficiently and at a lower cost. "We strongly disagree with the notion of everyone having a general purpose printer at home printing out products for themselves and their friends," Wohlers said. But for companies, "it's flattening the playing field where almost anyone located anywhere can become a product developer and manufacturer." It's almost certain that more big tech companies will embrace 3D printing. Hewlett-Packard (HPQ) CEO Meg Whitman, for example, announced in October that the company will enter the 3-D printing market sometime in 2014. Still, the speculative nature of 3D printing stocks might scare off some investors. It is probably not the best idea for any investor to have such a big concentration in one subsector. Remember what happened to many of the Internet mutual funds of the 1990s that loaded up on high-flying web stocks and crashed and burned after the tech bubble popped? Meckler knows this firsthand. He took a company called internet.com public in 1999. After several asset sales, the company now known as Mediabistro is trading more than 95% below its peak price from December 1999. But Meckler rejects the comparison to dot-com euphoria in the 1990s and claims the 3D printer naysayers simply don't understand the business. He said actual 3D printers are just the tip of the iceberg and that the industry has the potential to lead to big advancements in manufacturing as well as medicine. Meckler concedes that there will be ups and downs for the 3D printer companies, but that this kind of technological shift only comes around once every 20 or 30 years. So he's in it for the long haul. And he thinks investors in his fund should also be true believers. "This is for someone who thinks it's an earth shattering concept," he said. "You might call it the third industrial revolution." Even if he's right, there are arguably safer ways to invest in the trend.